You are here: Home / 1L / 1L Exams Start in a Week! What Should You Be Doing? 1L Exams Start in a Week! What Should You Be Doing? Believe it or not, December is here! Which means most law schools start exams in the next week or so. Scary thought, right? The weird thing about law school pedagogy is that your professor doesn’t just come out and tell you what you need to know for the exam. Neither does the casebook. So…you’ve got a problem! Where in the world are you supposed to find out what you need to know? From an old student outline: Similarly, starting with a well-organized prior outline which makes sense to you can help clarify the law you studied and show you what you really need to know. Make sure the outline is from your professor! Studying what someone else taught in detail is unlikely to help. In your class notes and case briefs: It’s possible to put together the law you studied yourself, assuming you took reasonably good class notes and extracted useful info from the cases you read all semester. However, at this point, it’s probably too late for this approach. Unless you’ve been outlining all along, use your class notes as a supplement to a commercial or old student outline. Whatever source you use, your goal is to boil down all the law you need to know into a few pages, which you can conceivably memorize. Having a 100+ page outline is not helpful. Hopefully making that outline helped you make sense of the law, but it’s time to condense it down into something that you can actually learn and use. Ideally, you’ll end up with a two-page “cheat sheet,” but it’s okay if it’s a bit longer. 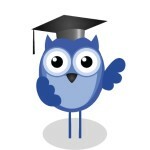 For more on how to figure what to study, check out Unprepared for Law School Exams? Here’s How to Avoid a Disaster. 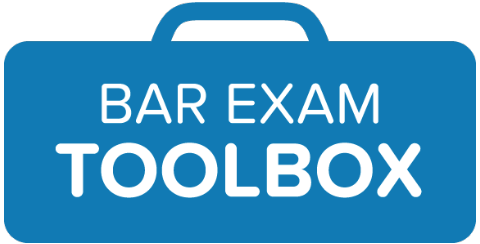 As we’ve discussed before, practice exams are critical to law school success as a 1L. That being said, I’m hearing from students who haven’t taken any practice tests, a week before their exams start. If you take away one piece of advice from this article, let this be it: Write a practice essay today! You don’t have to start with a full exam, but find a practice question (ideally from your professor) and draft an answer to it. Feel free to try doing it under exam conditions, but it’s also fine to use your notes (if your actual exam is closed book) and/or to give yourself more time than you’d really have. This isn’t an actual test! It’s for practice, and sometimes you’ve got to run before you can walk. I know students hate doing practice tests and never feel ready, but — seriously — what are you waiting for?!? Time is running out, and you need to figure out what you don’t know (or don’t know how to do) before your actual exams start. After practicing as much as possible, the next most important component to 1L success is typically getting feedback. Whether it’s from a study group, from your professor during office hours, from a TA, or even from a tutor (that’s what we do!) it’s critical to get feedback on what you’ve done well and what you might want to do differently in your sample answers. That’s how you learn and improve! While it’s not as beneficial as having fresh eyes on your work, a detailed self-evaluation can still be very helpful (and is something you can always do in conjunction with outside feedback, too). It’s too late to go back and read a bunch of cases. While of course you should keep up with class reading until classes are over, it’s really too late to go back and catch up on hundreds of pages of reading you didn’t do over the course of the semester. This is triage time. You have to focus on what’s most critical, and that’s finding the black-letter law, condensing it, memorizing it, and practicing. Force yourself to do this harder (but more beneficial) work now, and aspire to do a better job keeping up with the reading next semester. Time management during the exam period is critical to success. The exam period rewards intense, focused effort. The best way I found to consistently work at a high level for the required couple of weeks was The Circles method. If you struggle with focus, try it! It’s seriously a lifesaver. Along with time management, it’s important to keep an eye on your stress levels and creature comforts. If you’re not sleeping a decent amount nightly and eating well, you’re going to be a total mess by the end of exams. (Trust me on this one.) Sleep is critical for memory, and — unfortunately — is one of the first things to go when your mind is occupied with new concepts and you’re stressed out. For best exam results, prioritize down time and exercise, and give yourself mental breaks. Try taking a yoga class or do something else that requires focused physical attention. It might seem like an hour at the gym is time wasted, but it’s not. You can’t study 24 hours a day, so schedule some consistent time off and you’ll be more effective in the hours when you do study. It’s also worth thinking about how you’re going to handle stress in the exam room. There are various approaches, but the important thing is to have a plan, preferably one you’ve practiced. Are you going to take a few deep breaths? Repeat a mantra? Strike a power pose in the bathroom? All perfectly valid options! Just make sure you know what works best for you. Want studying suggestions sent directly to you? Join our mailing list today for great advice sent right to your inbox! Leave any exam-prep questions in the comments! 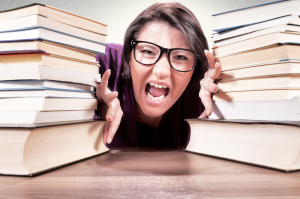 Concerned about your law school grades? Get the feedback and support you need to succeed. 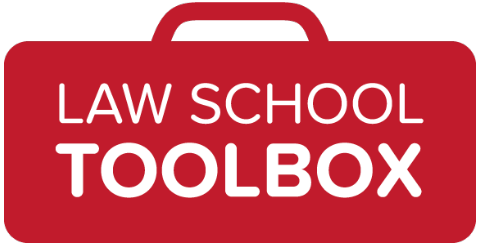 Check out our law school tutoring options at the Law School Toolbox. Get started, and ensure you're spending your time wisely! Got a question? Drop us a line. We're here to help! I'm the creator of The Girl's Guide to Law School®. Welcome! Columbia Law ('06), Law Review, federal judicial clerk, BigLaw refugee. Do You Like The Girl’s Guide? Sign up for The Girl's Guide email list to get all sorts of free goodies! Enter your email address now. Could A Designer Purse Cost You a Job Offer? Will I Get the Job I Want If I Wear My Natural Hair? Should You Go to Law School? I Failed the Bar Exam. Now What?